We’ve finally come to the end of Sultry Days, my serialised translation of Eduard Graf von Keyserling’s early novella Schwüle Tage. Hopefully, there will have been a few people out there who read along day by day, and if not, the story’s not going anywhere, so feel free to peruse it at your leisure 🙂 Before moving on from the whole endeavour, though, I thought it might be a nice idea to look back at the project and reflect on the translation process, along with some of the difficulties involved. While I may not have the same insights as those who do this for a living, a look behind the scenes is always fun, so let’s see what went into the making of the translation. I first stumbled across the text in digital form, both at the German Projekt Gutenberg.de site and on Amazon (that version was simply ripped from the Gutenberg source and converted to a mobi. file…). The original story ran to around 16,500 words, and my finished version came in at just under 18,000, which meant I added a little less than ten per cent to the word count. Before I’m accused of supplementing the text with my own ideas, though, I’m pretty sure that’s par for the course for DE-EN translations as German uses more compound words that English tends to break down (that’s my excuse, and I’m sticking to it!). Once I’d got over my paranoia that these digital texts might be missing a section here and there and finally committed to giving the translation a go, it was time to think about how to go about it. The first step, of course, was to read the book, and I did so twice before writing anything. Luckily, I happened to have a fair amount of time off work earlier in the year, and with the kids at school, there was no chance of going away, so a project like this was the perfect way to occupy myself – even if my wife might have preferred me to do a little more work around the house or in the garden… I had no idea how long the first draft would take, but in the end I managed to get it done in four weeks, working on average two hours a day, five days a week. Slow? Rushed? I have no idea – you be the judge. The story itself is a fairly simple one on the surface, telling as it does the story of the young aristocrat Bill and his summer in the country. It’s a classic Bildungsroman in many senses, with his discovery of sexual desires one important development; there’s a striking contrast between his rose-scented dreams of Gerda and the earthier reality he finds awaiting him. Of course, if we dig deeper, it’s a little more complex, with the young man’s illusions gradually crumbling as he becomes aware of just how complicated the big wide world can really be. Most of his lessons come, naturally enough, from his father, and Bill learns that this cold, rather distant figure is a person too, with the same desires, and flaws, as anyone else. Like many teenagers, our hero longs for romance (his poetic ambitions are mentioned on several occasions). His home for the summer is the perfect setting for such thoughts, with a backdrop of flowers and fields, beautiful farm girls and his alluring cousins. However, romance only goes so far. Over the course of the work, he sees how community and society compel us to conform, whether that’s in the case of his father or in his own dalliances with the local girls. As time passes, even nature seems to be playing its part. The atmosphere surrounding the party of friends becomes ever more oppressive, and a storm approaches, marking the end of the long summer. It’s only fitting that it arrives at the climax of all the tale’s events. However, if I were to choose one feature of the book that caused me problems (problems I’m not sure I ever really resolved), it would be the difficulty of capturing the right voice. There are several differences between the major characters, with Bill’s father switching between aloof didactic lectures and occasional ironic charm, and the sisters Ellita and Gerda chattering away breathlessly, seemingly using their words to avoid saying what they really think. Of course, it’s Bill, our young narrator, that is the key to the novel, and it’s not always easy to pin his voice down. There’s a fair amount of youthful bluster, and he often sounds a little pompous, and deliberately awkward. As a child learning about the adult world, he also becomes a little more introspective, questioning the beliefs he boasted of earlier. From the first reading I couldn’t help but be aware of the sheer number of expressions of uncertainty peppering the text, with Bill grasping for ways to describe people and actions he encounters for the first time. One of the overriding memories of the translation process is the frequent use of ‘it seemed as if’, ‘as if he were’, ‘like a …’ or ‘almost as if’. It’s a telling reminder that this is all being conveyed through the eyes of an impressionable youth, who is piecing events together as he goes along, without ever being in full command of all the facts. …but speaking of next time assumes that there’ll be a next time. While not a lady, I am one of Kate Briggs’ lady translators, in that this has nothing to do with my day job, and I’m not relying on its success to pay the bills (which is a good job as I’m not being paid anything for it…). I spent a good month, plus a few scattered hours here and there, producing something that at best a few hundred people (and that’s being optimistic) will have been mildly interested in, so (to some readers) the idea of doing it all again might seem a little… well, shall we say, stupid? That’s certainly one way of looking at it (and there have definitely been times when even I’d agree). Yet I enjoyed my time immersed in Keyserling’s text and what it demanded of me; it’s a rather different experience to that of simply devouring the text, knocking off a thousand words reflecting on the story, and then moving on. This isn’t exactly the most original of ideas, but translation involves reading at a much closer level than is usually the case, and that’s rewarding in its own right. 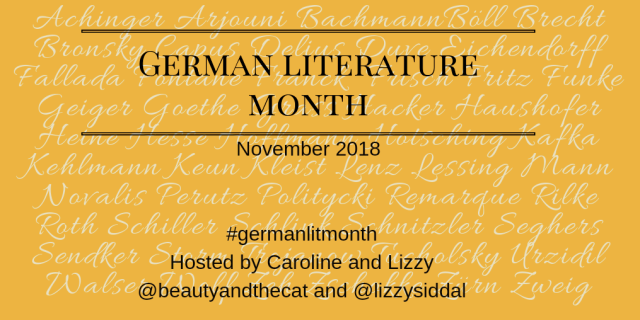 Hopefully, I’ve gained something from the process, whether that’s a greater appreciation of what goes into a text, or even just a little more ability to read German literature (although given the struggles I’m having with my latest book, I highly doubt that…). This was not an author I’d heard of before, so thanks for bringing it to my attention, and for taking the trouble to translate it. Really interesting insight into the process you went through to create it, too. I sort of understand why you did it. I remember translating a Spanish novel I’d studied for A Level Spanish, and had a gap year before university. I later discovered someone had already done it in English. Didn’t matter. The translator puts on the clothes, as it were, of the text and walks around in them until they fit. Sorry about the clunky metaphor. I had a great time reading this Tony. I was curious to know how you did this so I was hoping you would provide us with some sort of afterword 🙂 Your tool box and daily routine and the method you used, etc. I enjoyed finding all about this. I had suspected early in the reading that so rich a story with descriptions would present a good challenge. Also, replicating the voice of any narrator seems quite difficult to me, more so here because telling his story from a later point in time, the narrator is basically trying to replay his younger self using his “mature man voice” (it was not so obvious at first but it became more clear as I read along); it must have been challenging but fun. Thanks for sharing all this with us! I would like to thank you for the time you spent on this translation. I enjoyed reading it and it’s by an author I hadn’t heard of before. I can’t really imagine how difficult it must be trying to translate someone else’s words into another language, and it must be even more difficult when it’s over a hundred years old. I’m sure you can look at your efforts with pride. It is a truism that no-one knows a text better than its translator, Tony. That makes you the expert! So you get to determine the voice. Thanks for such a marvellous contribution to GLM VIII. Time for you to settle back into some relaxing reading now. Lizzy – Thanks 🙂 I’ve already finished a few more books for when normal reviewing service resumes! Great to read about your process, Tony! I like the point you made about the closer reading of the text. I often find it dissatisfying just to read and move on, read and move on. The process of translation must indeed force you to spend so much longer with the text, first rereading it and then going through line by line, word by word. I’ve never translated anything myself, but I remember from French and German A-levels a long time ago that simply reading books in a foreign language forced me to slow down and pay more attention to the language, and while I was doing that, I tended to spend more time thinking about other things like the themes and messages and authorial intent. I can only assume that with the extra layer of translating into English, that kind of thing happens even more. That kind of deep immersion in a single book sounds like a good experience to me.